Cozy accommodations and a relaxing hot tub are some of the prime perks our guests find at the Quality Inn Seneca which also offers an ideal location near Clemson University fishing lakes and other area attractions. All 60 exterior-access rooms at this two-story Quality Inn feature pillowtop mattresses 37-inch flat-panel TVs with cable hairdryers gourmet coffeemakers and work areas. Select accommodations also have microwaves and mini-fridges. The on-site fitness center helps guests keep up with their exercise routines and the hot tub is ready and waiting after a long day of work or sightseeing. Free weekday newspapers laundry facilities and 24-hour front desk service are some of the other amenities at the hotel. Pets are allowed for a fee. This Quality Inn is located on Highway 123 in Seneca within walking distance of numerous restaurants a cinema and two shopping areas. 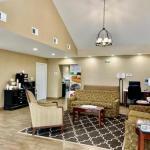 Oconee Medical Center is less than one mile away and downtown Seneca's Ram Cat Alley is four miles from the hotel. The Clemson University campus is a 15-minute drive away as is World of Energy the educational museum at Oconee Nuclear Station. Dozens of excellent fishing and boating lakes are within an hour's drive including Lake Jocassee Lake Hartwell and Lake Keowee which is two miles from the property. Greenville-Spartanburg International Airport is 54 miles away.